FBC EOC is currently at Level III (Increased Readiness). The FBC EOC will likely move to Level II (Limited Activation) with a partial activation of the EOC in the afternoon on Friday (12/7/2018). Emergency alerts, if any, and other information regarding potential flooding will be issued by the Fort Bend Office of Emergency Management, and may be monitored at http://fbcoem.org. 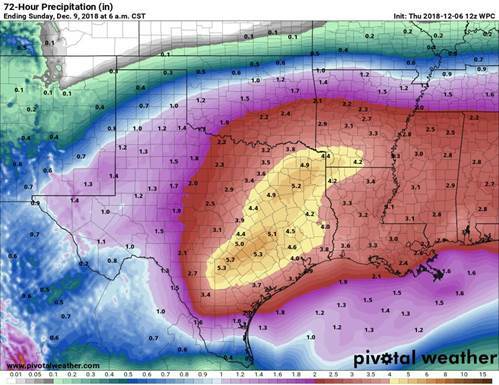 Based on recent forecast maps for rain, our area could get between 3 to 6 inches of rainfall while the upper portions of the Brazos River watershed, especially the Brenham area, could see 5 to 6 inches of rainfall. There also is the possibility of isolated amounts of 8 to 10 inches. With these totals and the short duration, we have an increased risk of street ponding with local rises in our creeks and streams occurring Friday night. This is particularly the case in areas with a history of ponding and/or poor conveyance. Currently the Brazos River in Richmond is at Gage 18.85 feet with no river forecast published. Based on the predicted rainfall, the Brazos River could rise through Fort Bend County; however, until we have more certainty on the location of these isolated higher rain amounts, the actual impacts to us will change. We will provide additional updates as necessary as things develop, but we encourage our residents to pay attention to local weather forecasts. 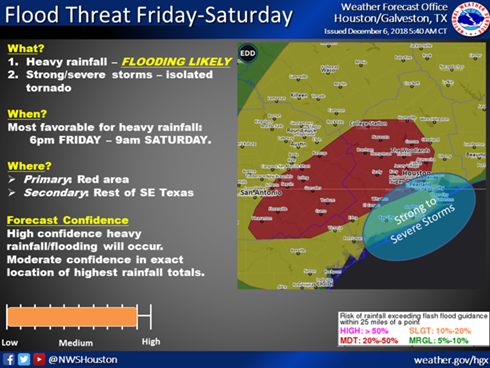 Our neighbors to the East, the Harris County Flood Control District, has issued information about a powerful storm system bringing high impact weather to TX starting later today. They have issued a Flash Flood Watch has been issued from noon Friday until noon Saturday for all SE TX counties. They advise Flash Flooding of streets along with significant rises on area bayous, creeks, and rivers to flood levels is possible. HCFCD says: Powerful upper level storm system moving into S CA and NW MX this morning will track generally eastward and into TX over the next 48 hours. SW flow aloft is already spreading clouds across the area with currently best moisture return focused across SC/C TX where scattered showers have already developed. Activity will increase today from the coastal bend northward along the I-35 corridor where favorable moisture transport overlaps with short wave energy aloft. Some of this activity will likely affect our far western and southwestern counties this later this morning into the afternoon hours.